This tweet took me back to simpler times when home theater-like sound came from an FM broadcast! I randomly came across a tweet with an image from an old TV guide listing. 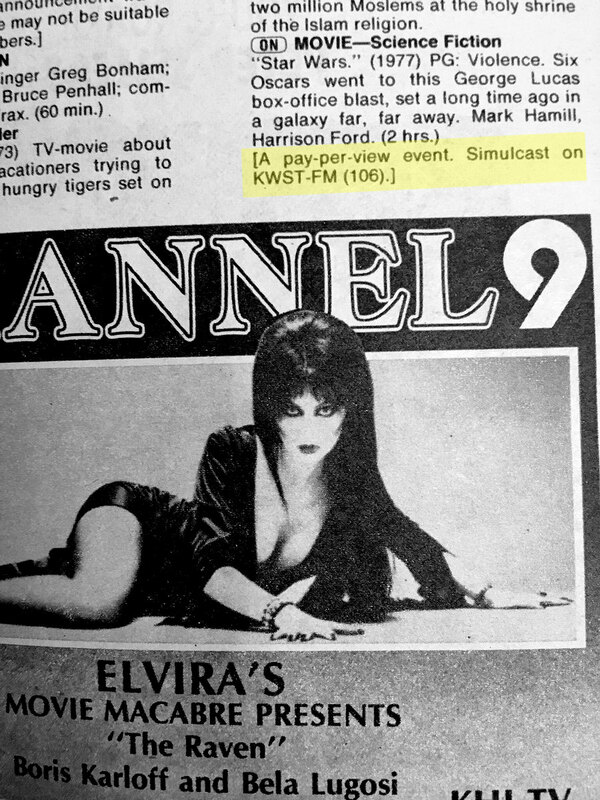 Channel 9 was touting Elvira's Movie Macabre, but the tweet was referencing a showing of the original Star Wars that referenced an FM simulcast. The tweet asked why anyone would want to listen to a movie on the radio. The answer is - no one. But the author was likely not old enough to remember when broadcast television was not in stereo and only emanated from the TV's small built-in speaker. This even predated sending an audio signal through your receiver to listen via hi-fi speakers. Simulcasts provided better audio to accompany the movie broadcast to your TV. With no simple bridge between your living room TV and the high quality speakers that were part of your stereo system, better quality sound needed another entry point. Your stereo's FM receiver was the solution. While you could watch and listen to Star Wars on your TV, a simulcast was synched with the TV broadcast enabling you to listen to robust audio via your stereo's FM tuner. It sounds like a bizarre way to watch a movie at home, but if you ever suffered from the meager sound of a 3" TV speaker, filling the room with quality sound brought an amazing new experience to watching a movie at home. These days we're spoiled by connectivity that lets your phone turn on the coffee pot each morning. Back in the day, simulcast brought a new life to a broadcast movie. Home theater has come a long way, but it wasn't always that way! Simulcasts were also used for other purposes including alternate languages before captions were available. Some sports events were simulcast in Spanish for listeners. It was part of television's growth that spurred better and better solutions. Think about that next time you're streaming audio with out having to own the album or a CD player. 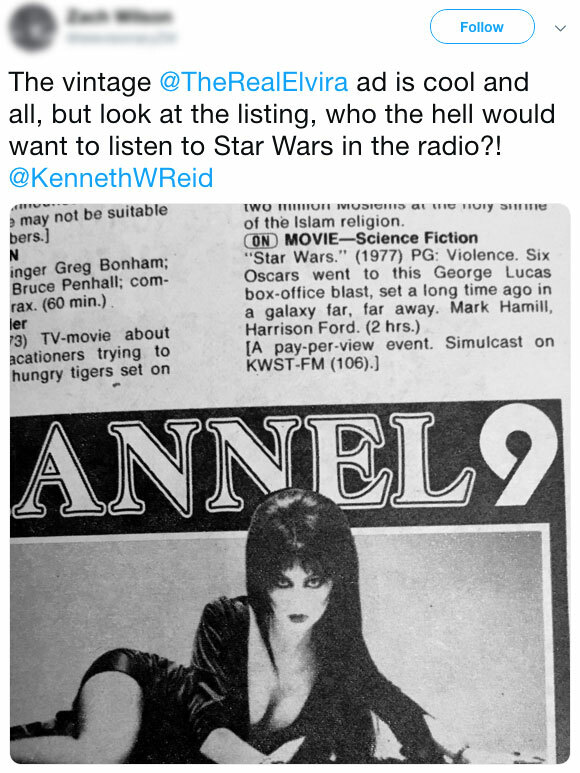 "The Raven" was featured on Elvira's Movie Macabre, episode #49, on September 25, 1982 - the likely date of this Star Wars showing with simulcast on KWST FM 106.